I really felt like I was going to have one more great Southern Resident encounter before the season was over. 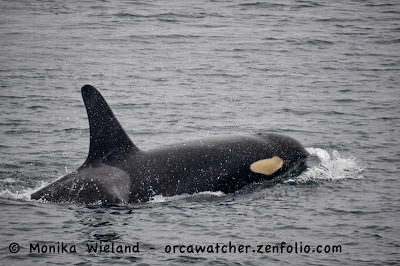 When I went out with Jim Maya on October 5th, I thought that might be the day, and while we had an amazing experience with humpbacks and transient orcas, there wasn't a resident whale in sight. 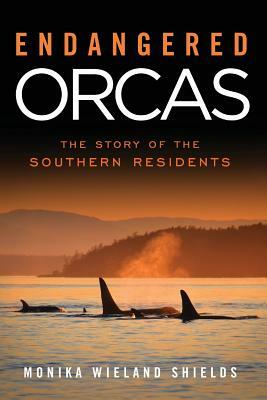 Turns out Sunday, October 20th was to be the resident orca day! 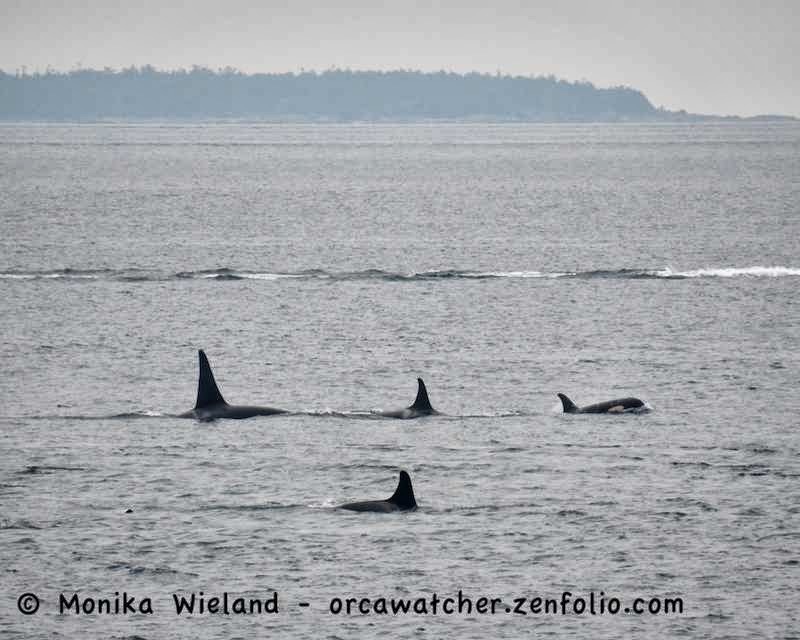 In the morning I heard whales had been detected on the hydrophones, and thanks to an update from a friend learned there were a lot of dorsal fins on the west side of San Juan Island. Skipping breakfast, I grabbed my gear and thankfully an extra coat (it was COLD out there) and headed out to Land Bank's Westside Preserve. 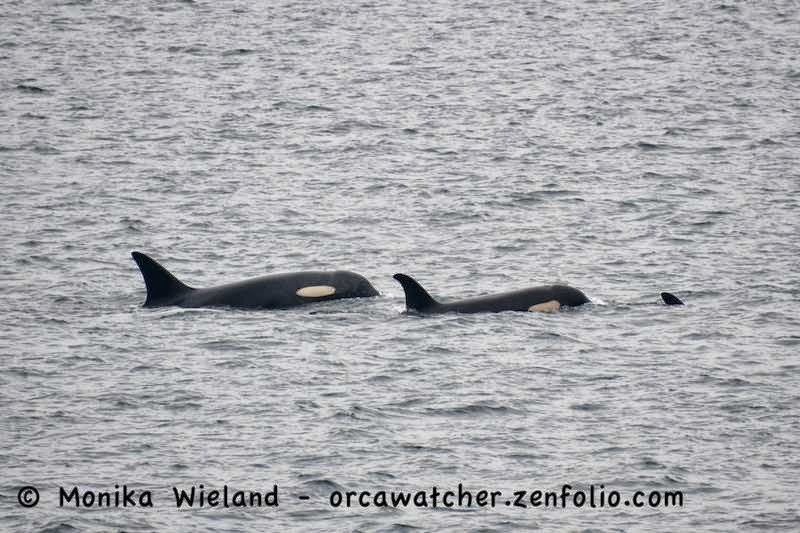 Right when I got there the lead group was passing heading north, and among them were J2 Granny, J19 Shachi, and L27 Ophelia. 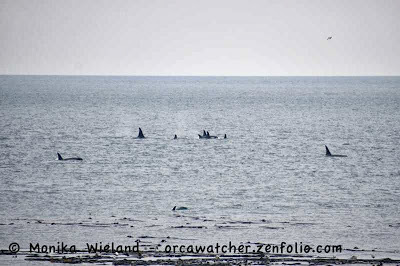 It was clear the whales were moving very slowly and were very spread out, doing lots of stopping to forage. 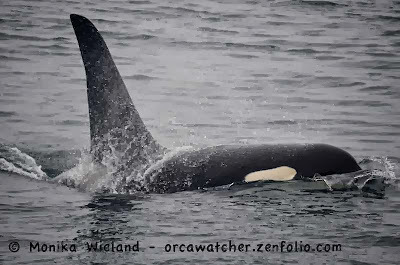 After the lead whales passed, L53 Lulu hung out in front of me for a while, cruising back and forth and even taking a moment to play in the kelp by herself. 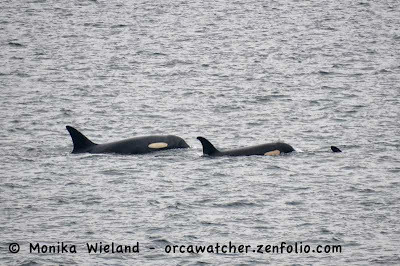 After Lulu moved north, the next group of whales to hang out were males L92 Crewser and K21 Cappuccino who were quite enamored with J14 Samish. 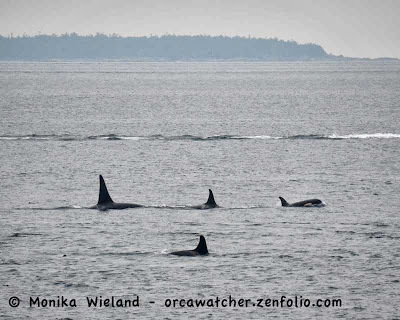 There were quite a few whale folks out to see the orcas, and with long gaps between groups of whales, people were coming and going as the cold settled in. With blows always visible just past the point to the south, however, I just couldn't bring myself to leave. 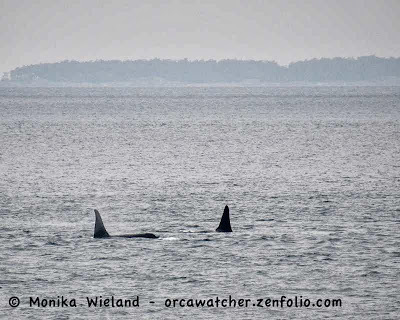 The first "pay off" for waiting was a nice pass from a group of L-Pod whales including L72 Racer, L105 Fluke, L106 Pooka, and L116 Finn. 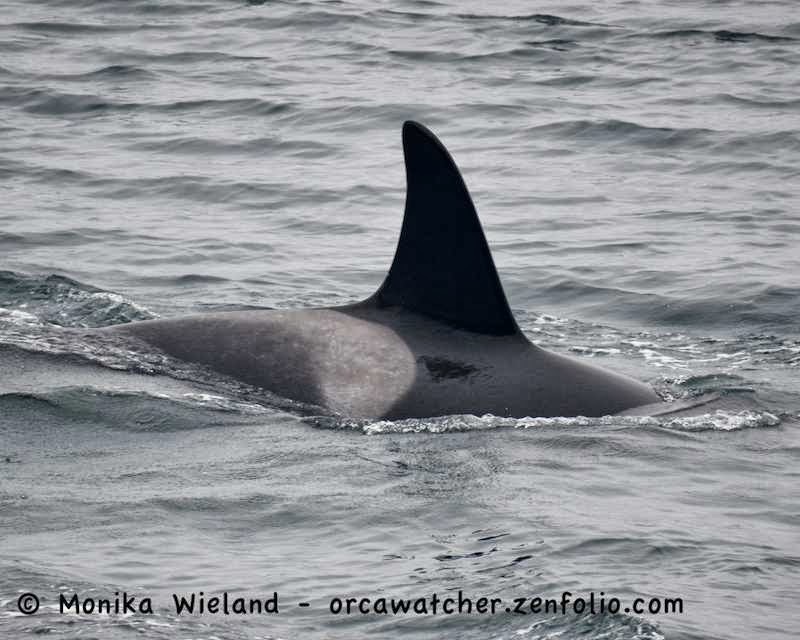 Lots of dorsal fins out there! 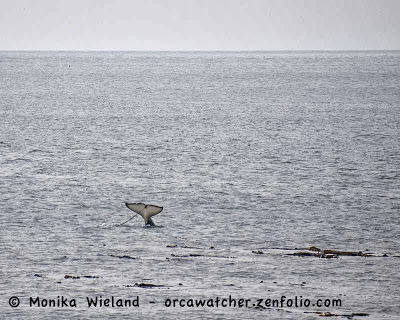 As the whales passed Land Bank, they started veering in towards shore a little bit more. 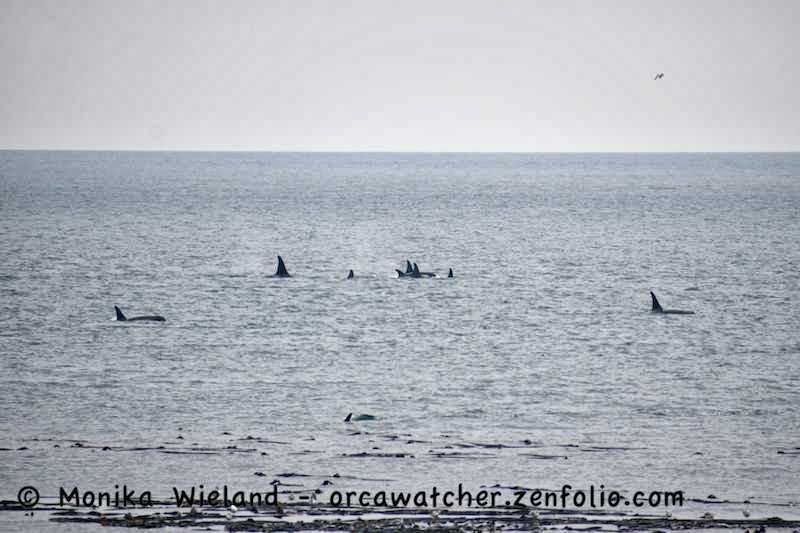 This is always a conundrum: they may pass closer to shore at Lime Kiln, but it's hard to make it from one place to the other before the whales do. 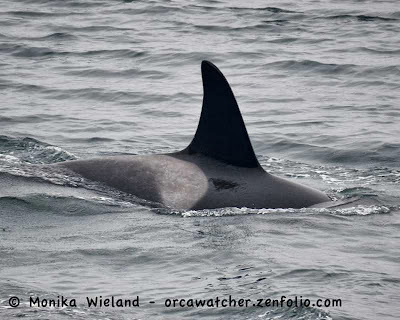 With him were two ten year-old males J39 Mako and J38 Cookie. 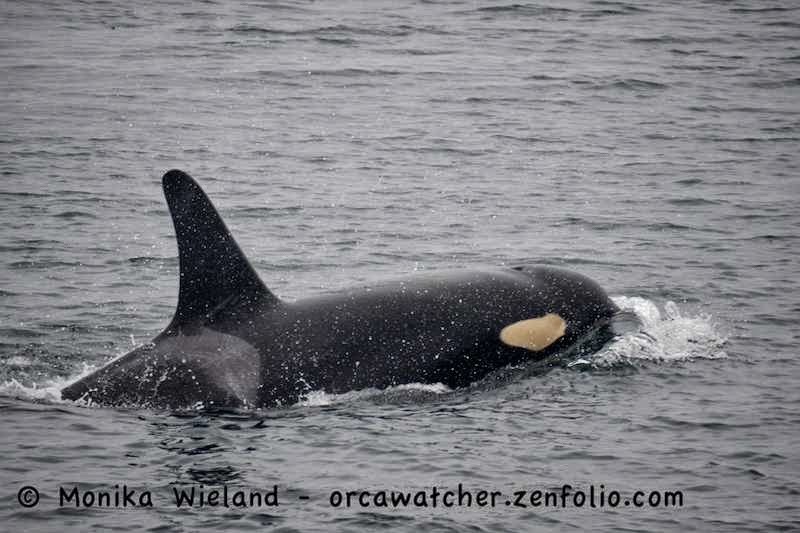 I saw these two playing together as calves, so it was neat to see them still spending time together a decade (!) later. We walked down to the lighthouse to see the whales disappearing to the north. 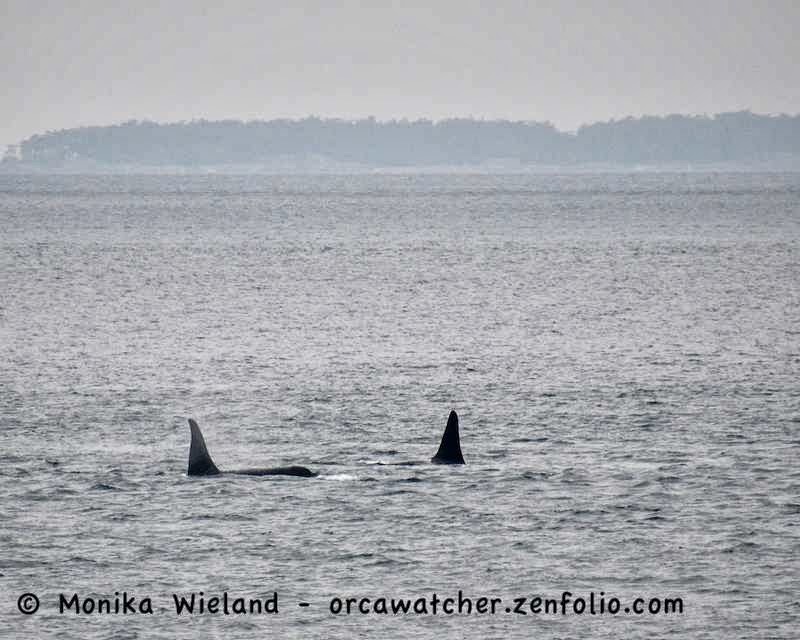 By this point, over three hours after getting out there, the whole superpod had passed, and it was definitely time to warm up and get something to eat. Later in day, after dark, they came back south, and the vocals on the Lime Kiln hydrophones were amazing. So many people were tuning in I couldn't even get on to listen, but luckily some of the folks that were tuned in were recording. 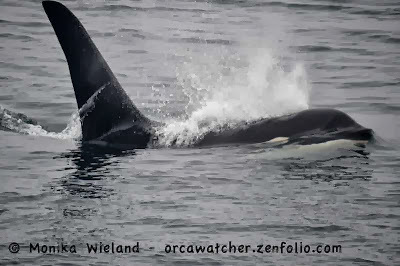 Click here to listen to a half hour recording posted by Marcie Callewaert, a photographer from Victoria. These are about the best vocals you will ever here: a talkative superpod with no boat noise to drown them out. I've been listening to it while I wrote this post! 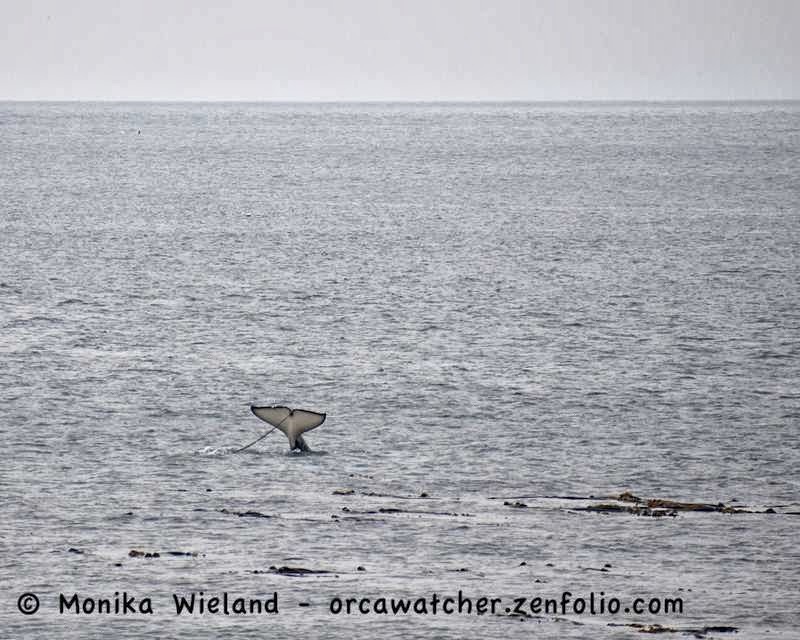 By Monday morning, the whales had moved on, and there weren't any reports as to there whereabouts. It just makes that one day visit all the more special. This time of year, it could very well be my last sighting of them for the season! What a likely grand finale to the season. So happy for you! Think there's more fins in the 'boat' pic than the whole of British waters! Beautiful, amazing images! Thank you.